Marie-Louise's father put her name down for a place at the newly opened Jules-Ferry Lycée and there her brilliance was noticed by her teachers, especially the mathematics teacher who was the sister of Élie Cartan. Marie-Louise took the baccalaureate in elementary mathematics and at this stage encountered a particularly good piece of luck. One of her best friends in her class at school was Denise Coulom who was the daughter of the head of the Collège de Chaptal. This College, named after the French chemist Jean-Antoine-Claude Chaptal, had special mathematics classes to which girls were not allowed entry, but M Coulom was persuaded by his daughter to make an exception in the case of Marie-Louise. At this school she was taught with the exceptional mathematics teacher George Milhaud. Often one piece of good fortune is balanced by bad fortune and in the case of Marie-Louise's study at the Collège de Chaptal this was exactly what happened. Her father had been ill for some time and the strain of seeing him nearing the end of his life made it difficult for her to take full advantage of the opportunity the school gave her. When she took the university entrance examinations she did not do sufficiently well to gain a place in Paris and was only given a Bourse de licence which allowed her to enter higher education outside Paris. She was persuaded by Milhaud to spend another year at the College and try again to gain entry to the École Normale Supérieure. The ranking was published with the official note: "The nomination of the students to the École Normale Supérieure will be by order of rank". But the decree of the ministry published afterwards in the official journal named twenty male students at the top and then Marie-Louise at the head of the Bousiers de licence. This decree had moved her down to 21st place. She expressed her "sad disappointment" to the Minister of Public Instruction and Fine Arts, Édouard Herriot (1894). She asked to be allowed to attend the École Normale Supérieure as an extra day pupil or, if that were not possible, to take courses at the school so as not to lose "the minimum benefit of her rank of admission." I do not know who has done this. What is certain is that Mlle Jacotin was second in the examination for the École Normale Supérieure and that she is a pupil of this school ... But she should be careful. She is going to create a precedent and traditions. On her will depend what we will be able to decide concerning future candidates. Further pressure on the administration to justify their decision to prevent Mlle Jacotin studying at the École Normale Supérieure resulted in them backing down, and she was given a place to study in Paris. She was able to begin her studies in 1926, although it took until February of the following year before she was able to formally matriculate. Two other members of her class at the École (with biographies in this archive) went on to become famous, namely Jean Leray and Claude Chevalley. Jacotin attended lectures on fluid mechanics by Villat at the Sorbonne and lectures the Collège de France. Lebesgue and Hadamard were among the lecturers who taught her during her outstanding three undergraduate years. Jacotin graduated in 1929. Ernest Vessiot, Director of the École Normale Supérieure, arranged a scholarship for Jacotin to undertake research. She had been attracted by the course on fluids given by Villat and he now advised her to go to Oslo to study with Vilhelm Bjerknes who had been appointed to the chair of applied mechanics and mathematical physics at the University of Oslo three years earlier. Bjerknes had published his most important work On the Dynamics of the Circular Vortex with Applications to the Atmosphere and to Atmospheric Vortex and Wave Motion in 1921 and at the time that Jacotin visited him he was working on a project to write a large textbook on theoretical physics which he hoped Jacotin would translate into French. It was a project that Bjerknes never completed. She told him about an important difference between the irrotational wave he had just described (of a ideal liquid with a free surface) and a rotational wave which Gerstner had described a long time before (the cycloidal wave). This provokes a movement of mass in deep layers. Levi-Civita, surprised and interested, encouraged her to continue her studies. She established the existence of an infinity of waves, those of Gerstner and Levi-Civita being two examples. This would be her thesis. Its importance and that of her work on the theory of waves meant that she extended work on it until 1935. The jury was presided over by Ernest Vessiot. The other members were Gaston Julia and Henri Villat. Jacques Hadamard came to help with the defence and to sit at her side. Dubreil-Jacotin's interests in algebra had now reached the point where she offered it as a subsidiary subject at her oral. Following the award of a doctorate she went to Nancy where Paul Dubreil now had an appointment at the University. It would have made sense for the University of Nancy to employ Dubreil-Jacotin too, but they did not wish to employ a husband and wife in the same department. Dubreil-Jacotin, therefore, accepted a position of research assistant at Rennes. ... she became a full professor at Poitiers where in 1955 she held the chair in Differential and Integral Calculus. It was at Poitiers that I knew her. I am able to confirm that she began the development of this maths department where she amply filled her role as teacher and researcher. She kept the future in mind by gathering round her a community which comprised Arbault, Croisot, and Lesieur. This group was later enriched by others. Among them we must include, for the theory of semigroups, M P Schützenberger. The defeat, the occupation and the liberation made these never-ending trips to and from Paris slower and more difficult and dangerous. The train that Marie-Louise took each Tuesday was destroyed by a bloody bombing of the Rennes railway station. Fortunately this happened on the Mardi Gras holiday of 1943. It was in 1944 at St Pierre des Corps that she found herself under bombardment. She spent an anxious and sleepless night made worse by twenty-four hours without food. During the winter of 1944-45 the trip from Poitiers to Paris meant crossing the Loire river by foot bridge that rising water was on the verge of washing away. Marie-Louise accepted the risks calmly as part of her job. In addition to many other tasks she was co-director of the Algebra and Number Theory Seminar and the driving force behind a group actively working on ordered algebraic structures. Her teaching was reorganised to follow new reforms in the curriculum and put her in touch with applied maths and information technology. in her collaboration with Paul Dubreil she had brought to light the notion of permutable equivalences. 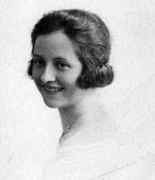 She also began research into the theory of groups, semigroups and algebraic congruences on her own and in collaboration with P Dubreil or R Croisot. Starting in 1948, she dealt with ordered sets by first treating the question of regular equivalences and then studying ordered sets under a multiplication law. She introduced the notion of a semi-reticulated semigroup just as the equivalence relations allowed her to generalise the ideal theory of Artin-Prüfer. Some of the results she obtained are published in the second part of 'Lessons on the theory of lattices, of ordered algebraic structures and geometric lattices' published in 1953 ... in collaboration with R Croisot and L Lesieur. It was D E Rutherford who suggested that I should follow the old Scottish tradition of doing research on the Continent. (I discovered somewhat later that he, who had a doctorate from Amsterdam, was the only example of this old tradition that I could find!) Thus he arranged for me to go to Paris with a NATO scholarship, to be supervised by Madame Dubreil-Jacotin. This was my first trip out of the UK and it was arranged that I meet her at the Institut Henri Poincaré at 5 pm on the day after I arrived in Paris. Equipped with only high school French (most of which I had forgotten during my undergraduate years), and feeling as hopeless as an illegal immigrant, I managed to find my way there with the aid of a borrowed map of the Métro. The meeting was memorable. Naturally the first thing I asked was if she spoke English, to which she replied simply 'En France, on parle Français'. After an hour or so, during which my French improved dramatically, she told me to accompany her in her car since she had to go to the Place Vendôme to meet her husband. On reaching the ground floor of the Institut Poincaré we encountered a throng of students which parted for her as did the sea for Moses. Scurrying along in her wake, I realised that this was no ordinary Professor. On arriving at the Place Vendôme she told me to see her again in two weeks, after I had enjoyed discovering some of the niceties of Paris. A handshake and an au revoir left me to find my own way back to the Collège Franco-Britannique where I was staying. Luckily I had that Métro map! Supervision by her was a joy. She claimed that she could not easily read my writing (in truth it was the other way round) and gave me a portable typewriter to prepare the material for her inspection. We met every two or three weeks in the late afternoon, either in her office or at her house in the 16th arrondissement. This was invariably followed by dinner, often in restaurants that I could never hope to afford. I last met her in 1970. At the International Congress in Nice there was a splinter group on Semigroups, chaired by her husband Paul. At the beginning of one of the sessions he called the rabble audience to order. In our thus interrupted conversation she wryly commented to me 'il y a des professeurs qui sont les dictateurs' to which I could not resist the reply 'oui, et il y en a qui sont les dictatrices!' Her jovial acceptance of this will always remain with me. I owe her, and her husband Paul, my entire subsequent career and memories of them stir great affection. She had determination, intelligence and composure. To these personality traits she added what were then considered more feminine qualities. Her colleagues admired her deeply even if they felt shy about expressing their affection directly to her. She, however, sensed their support and felt that it helped her when she had serious difficulties. She was a pioneer not by choice but by necessity. She needed boldness and daring to overcome the obstacles which the time in which she lived placed in her path. She was, however, changed neither by her ambition for an exceptional career nor by a passionate feminism. These were both aspects of her rich personality and the need to express herself in her own individual way. She loved travelling and was delighted to fly over the Grand Canyon in a helicopter. She also explored the bush in Senegal ... She took very lively and artistic photographs. She enjoyed playing tennis with her friends as well as bridge, but the sea, and especially sailing, was her first love. Her love of life was exemplified when, in a force six to seven wind she sailed around the Isle of Ré in a "beluga" [a kind of dinghy]. In her memory the Ile de France Yacht Club founded a "Challenge Marie-Louise Dubreil-Jacotin" judged on two contests: a regatta and a bridge tournament. Tragedy hit the Dubreils in October 1970 when their daughter died. Two years later Dubreil-Jacotin was involved in a car accident which did not seem too serious at the time but she died of a heart attack five weeks later. The development of the teaching of women, the overturning of prejudices, the profound changes in the kind of life and role assigned to women in recent years have led, without a doubt, to a change in the place held by women in science. One will see how women will be able, on a par with men, to develop from the role of good student or collaborator to become scholars whose work will open new directions. Article by: J J O'Connor and E F Robertson with thanks to Jean O'Connor.